Easter is around the corner and once again I have prepared a delicious Easter related post for you guys! I was brainstorming with myself about what I should make and create with this years Easter baking. Last year I’ve made mint meringue baskets treats, because meringues are basically all eggs(whites) and you can’t avoid eggs with Easter right? So I need to come up with a recipe with eggs as main role. Eggs are great things really. 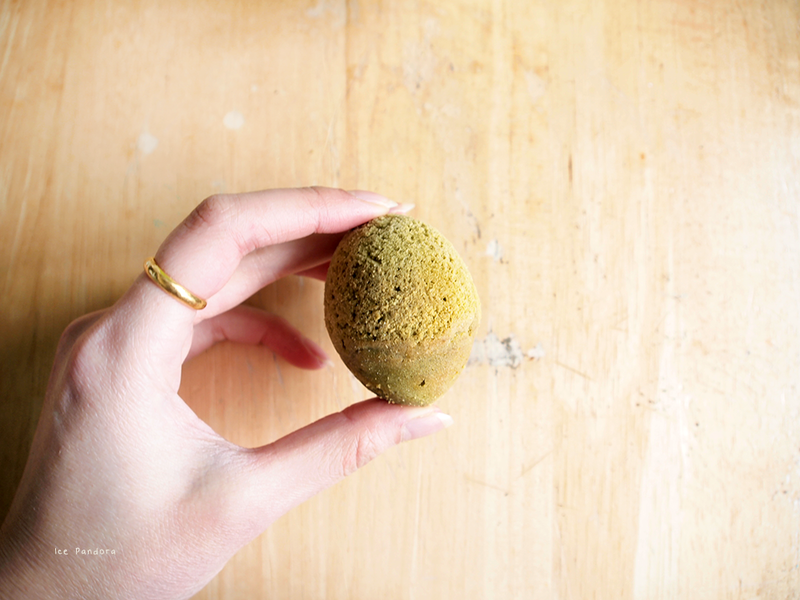 Have you checked out the 14 egg tricks here? Yes, eggs are great! 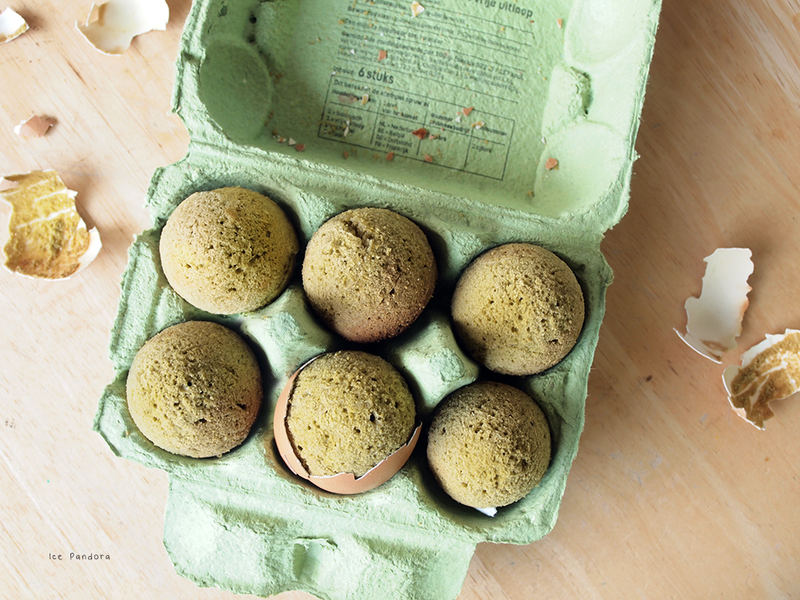 But here’s another egg trick: Easter eggshell Green Tea Cupcakes! 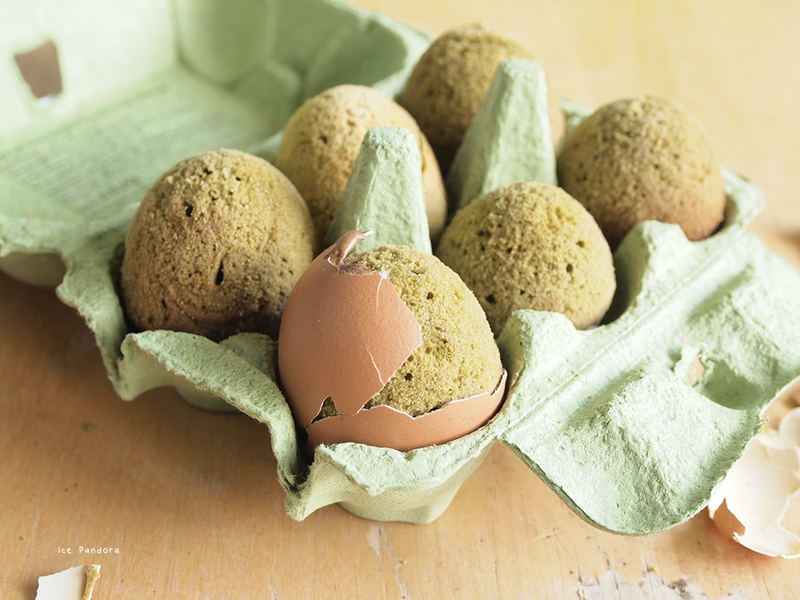 Wouldn’t it be funny to expect to have a nice boiled egg but instead you’ll find a cake egg inside your eggshells? 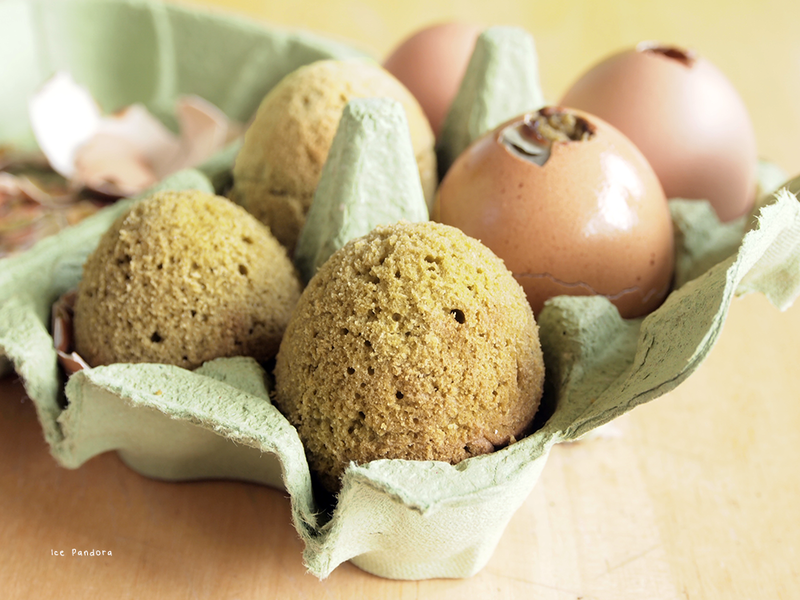 This recipe does require some patience, creativity and concentration with eggshells but that should not spoil the fun. Guaranteed joyful and surprising faces (even for adults). So try it out for your upcoming Easter breakfast! Het is alweer bijna Pasen en dat betekent dat ik weer een heerlijke Paas gerelateerde post voor jullie in petto heb! Ik was met mezelf aan het brainstormen over wat ik zou maken voor de Pasen van dit jaar. 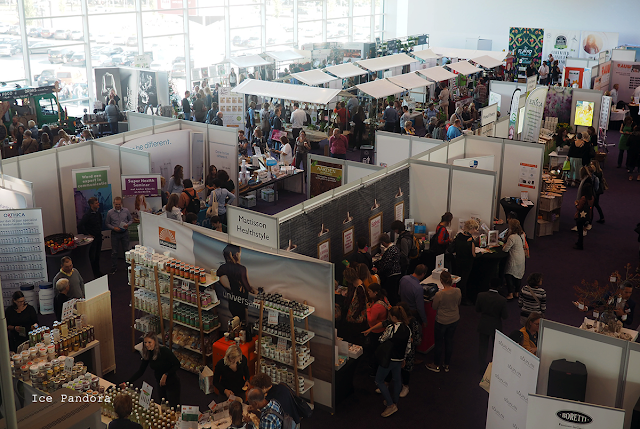 Vorig jaar heb ik een munt meringue mandjes gemaakt, omdat meringue in principe gemaakt zijn van eieren en je kunt natuurlijk geen Pasen vieren zonder eieren toch? Dus ik zal een recept creëren met ei als hoofdrol. Eieren zijn fantastisch. Ken je deze 14 trucjes met eieren al? Maar hier is nog een ei truc en tevens de post van vandaag: groene thee cupcake in eierschaal! Zou het niet grappig zijn om te denken dat je bij het pellen van een ei een lekker gekookt ei zou verwachten maar in plaats daarvan wordt je verwelkomd met een cupcake ei! Dit receptje vraagt wel enig geduld, creativiteit en concentratie met eierschalen maar dat mag de pret niet drukken. Gegarandeerd blije en verassende gezichten (ook voor volwassen). Dus probeer het uit met je Paas ontbijt! Bath time! Soak them for 30 minutes in salted water. 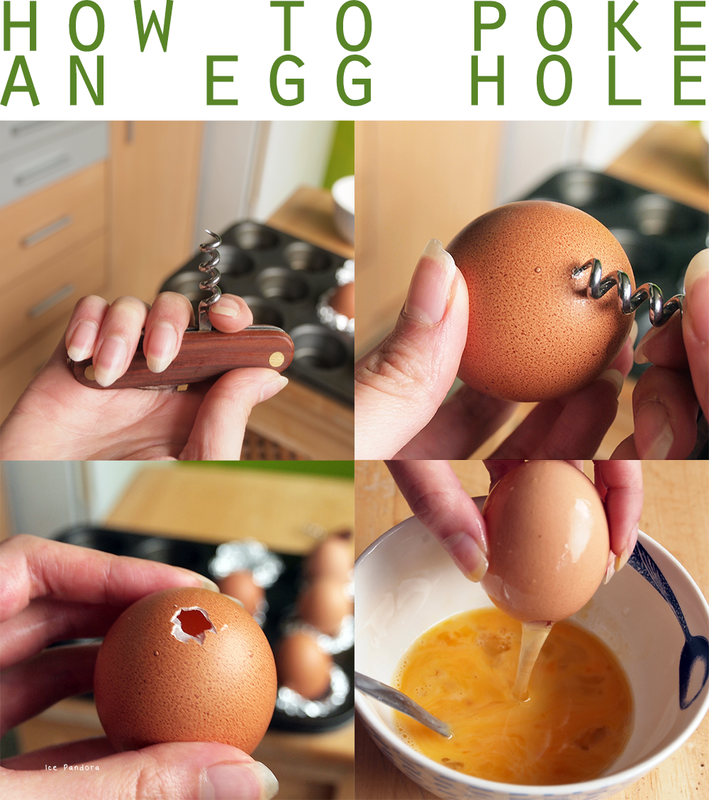 Then pat dry by letting the eggs stand up with the hole facing down. Green tea flavor, how cliché of myself but I just can't help myself. I HEART GREEN TEA! 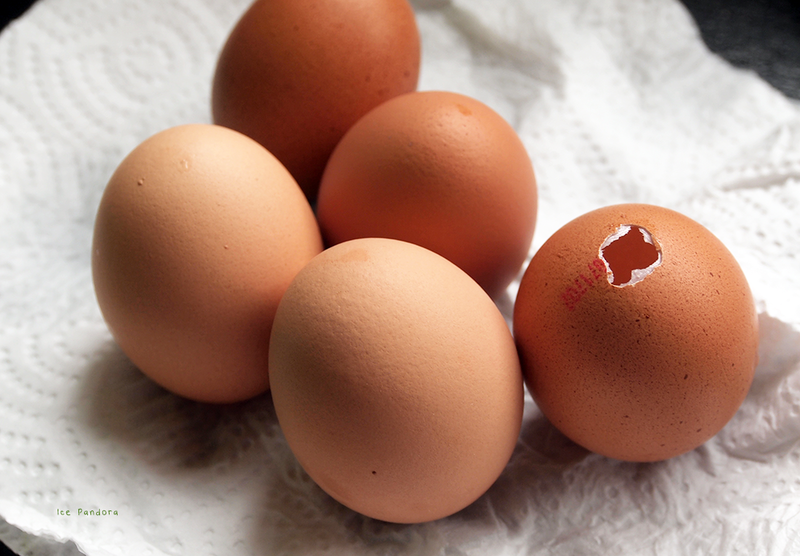 One of the eggs did cracked during the baking due to overfill. So folks, don't overfill. To think of, it's quite a guilty-free cupcake. There's zero high-calorie topping and sprinkles! 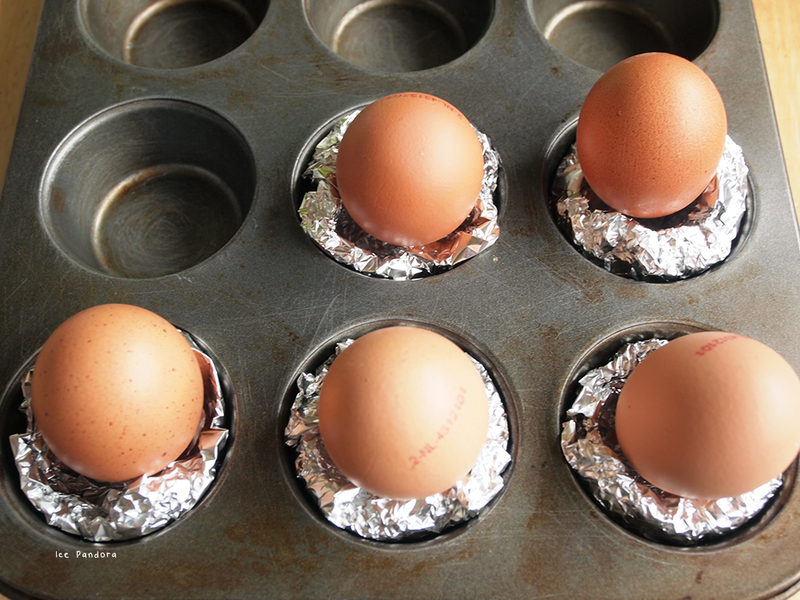 With tin foil make baskets inside a muffin pan for the eggs to be able to stand when baking it. 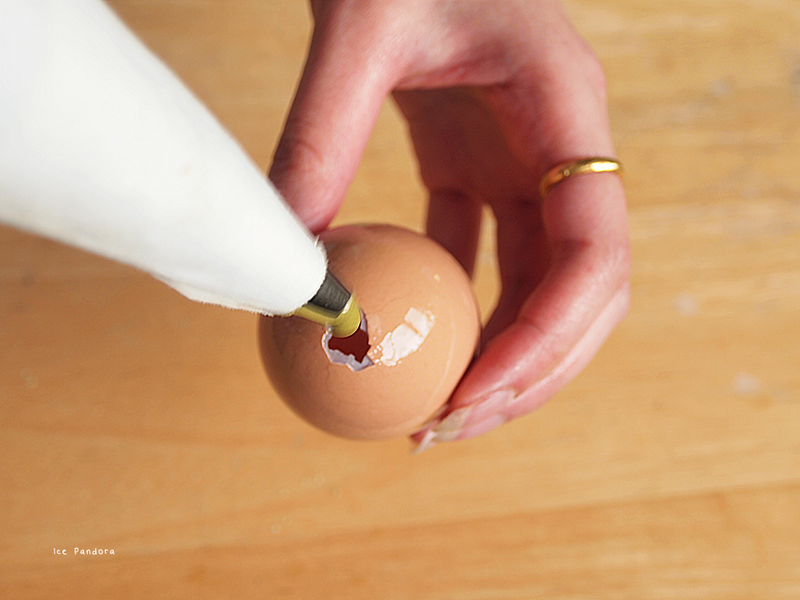 Preparing the hollow eggs: poke a hole in the bottom of the egg with a corkscrew bottle opener. 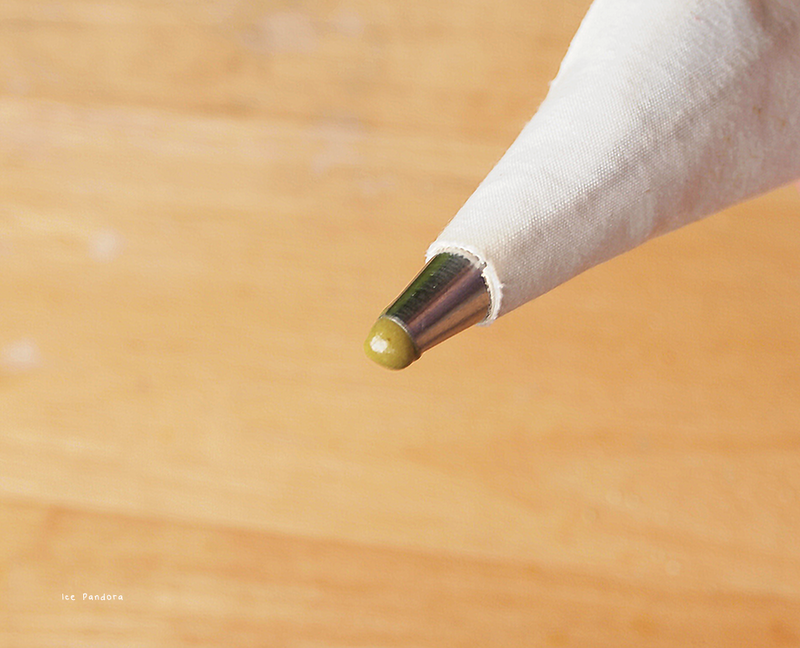 Once you've made a hole, expand it with a fork/knife. The hole should not be bigger than the tip of the piping bag! Drain the content of the eggs in a bowl and set aside for future recipes. Don't forget to set 1 egg aside for this recipe! 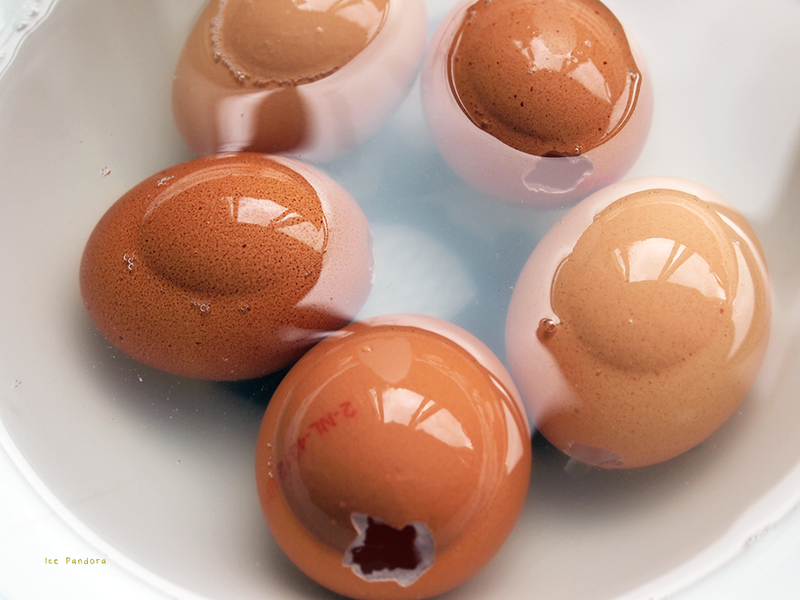 Rinse the eggs and soak them in a container of water + salt for 30 minutes. Than dry them on a piece of kitchen towel with the hole side downward. 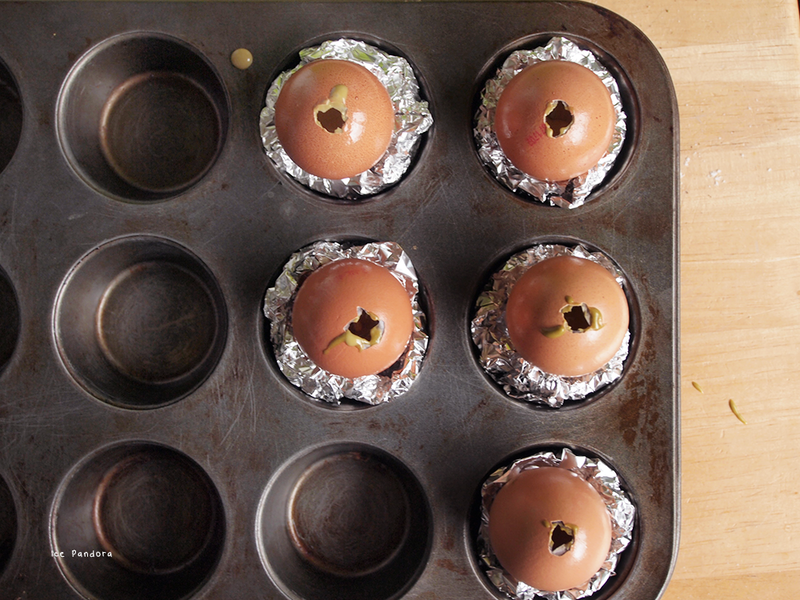 To avoid sticking coat the inside of the eggs with vegetable oil by rolling it around a few times. Then remove access oil. 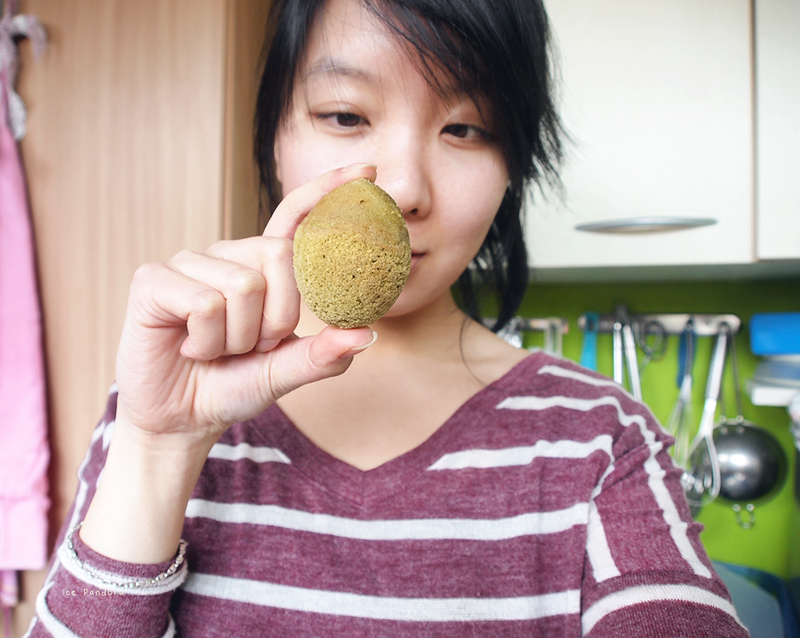 Prepare cupcake: beat egg with sugar until pale and creamy. Add the butter and vanilla extract and beat again. 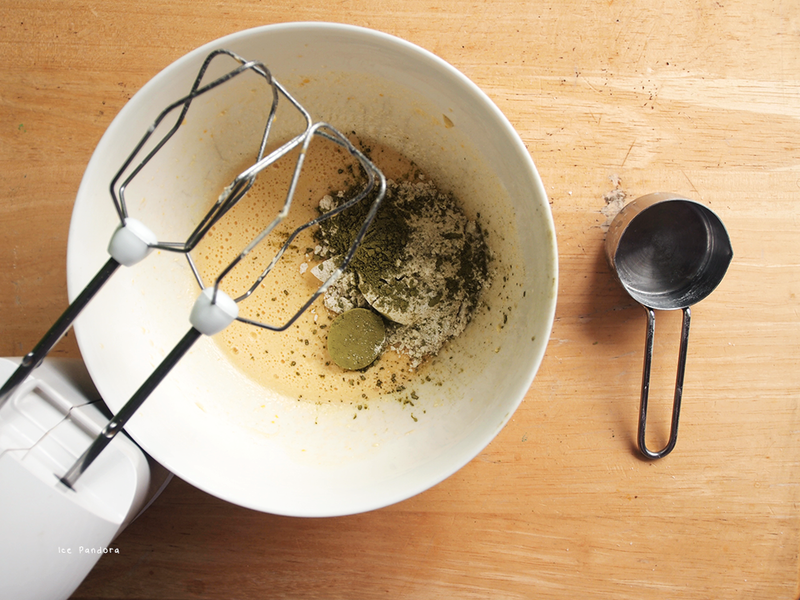 Then add flour, green tea powder, baking powder and salt and beat once more until well combined and smooth. 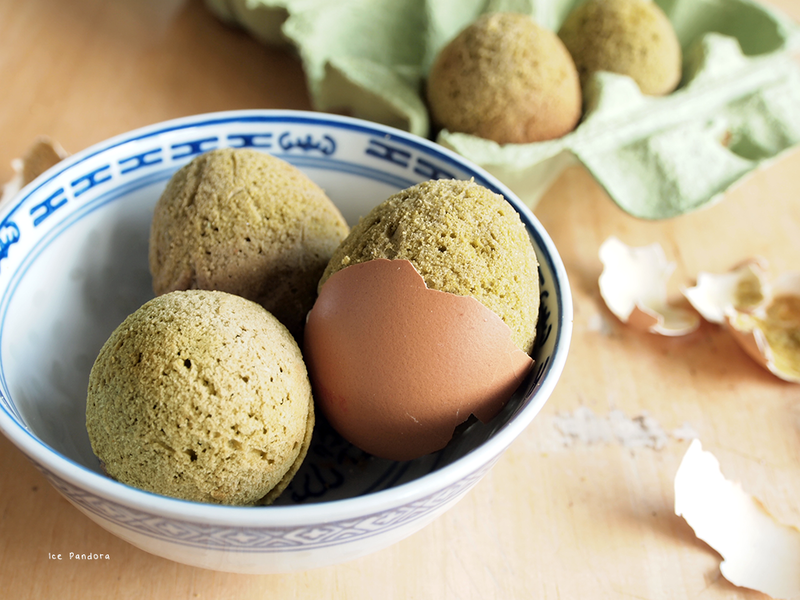 Spoon the green tea cupcake batter in the piping bag and careful fill the eggs 50% - 60% with the batter. Don't overfill because it will ooze out the cake + higher chance that the eggshell will break. Bake the cupcakes for 20 minutes in the pre-heated oven. Let it cool down, peel & crack and enjoy! Dit is echt super cool! En heel origineel! Al ben ik wel bang dat ik meteen het hele ei stuk maak tijdens het doorboren.. Such a cute idea! It looks like it requires some patience for this recipe as you mentioned, but it will be well worth it! Oh my gosh I would have never thought this was possible! I love it! And green tea flavored cupcakes sounds sooo good! 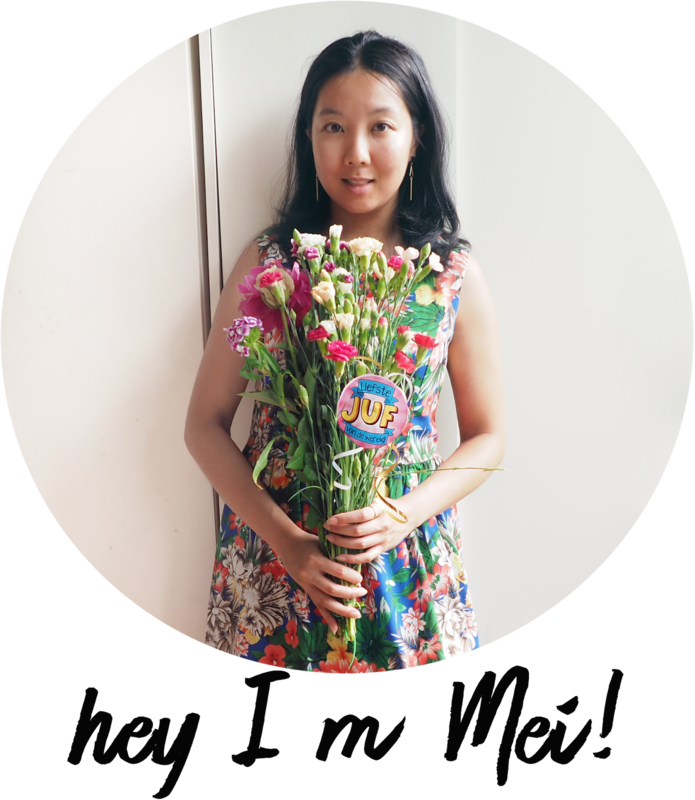 What an amazing idea and recipe Mei! Sadly I can't bake in my apartment here but I'm certainly sending this to my Mama and sister in the UK to try out for Easter (: hope you're doing well sweetheart! Wow! That is so creative !! Ah, this is such a fun idea! This is amazing!! 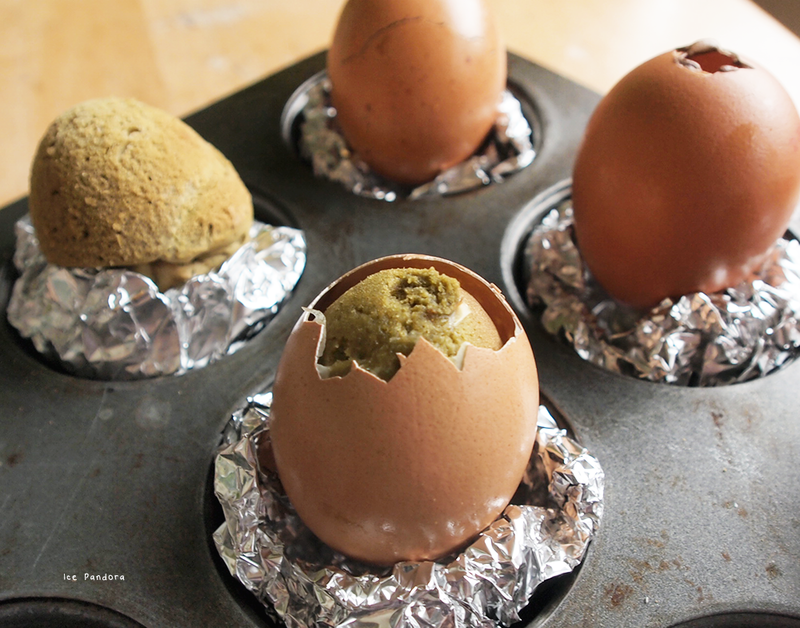 I'm bookmarking this to make on easter morning! These look so delicious! Wow! Wat een leuk idee! Haha oh my gosh! This is genius! How freaking creative and cute of you! I love the egg shapes! I love green tea too! You never fail to amaze me Mei! Wow! 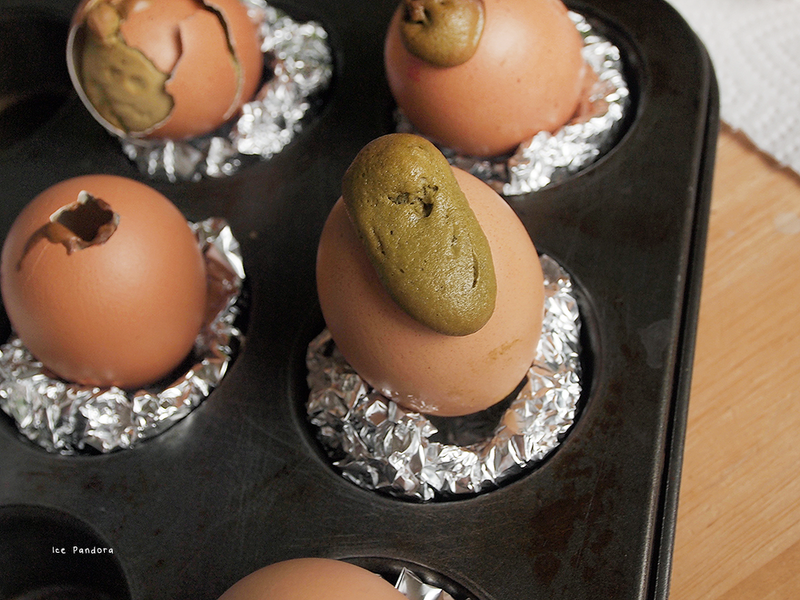 What a cute take on cupcakes and easter eggs? !